While some keep life lists for birding, ours is based on making pasta. With inspiration from Rose’s Vietnamese version, we now can add Japanese udon to our life list as well. Where her noodles utilized a mix of tapioca and rice flours, this one calls for wheat flour, a deceptively simple switch that changes the color, texture and workability of the dough. 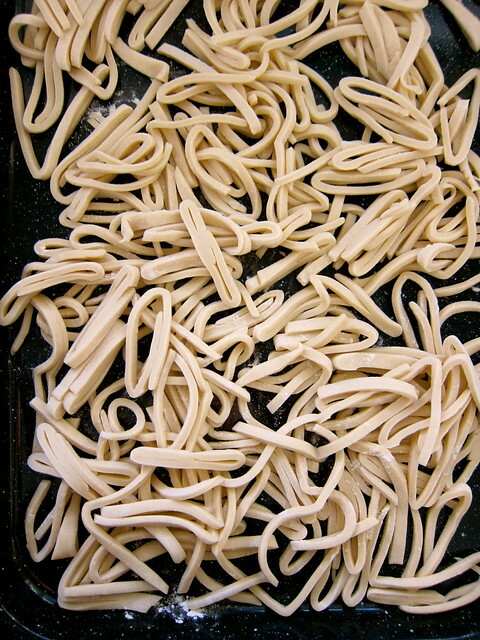 A characteristic of good udon is its chewy bite, a texture obtained only through aggressive kneading. Most sources give the baffling instruction to knead the dough by placing it in a plastic bag and repeatedly stepping on it. It felt slightly embarrassing, but faced with a mass of unyielding dough, this is what we did. Based on a traditional method, gravity does the work, though it’s still unclear what the Japanese used before the invention of plastic bags. After half a dozen turns or so, the dough eventually became silky smooth, a sign that it was ready to rest, as were we. We left it to relax overnight, however, when we went to roll it out, the dough was stubbornly resistant. It was as if it could sense our anxiety and caused near defeat. With some reconsideration, we remembered our pasta machine and felt silly that we’d been so intimidated. 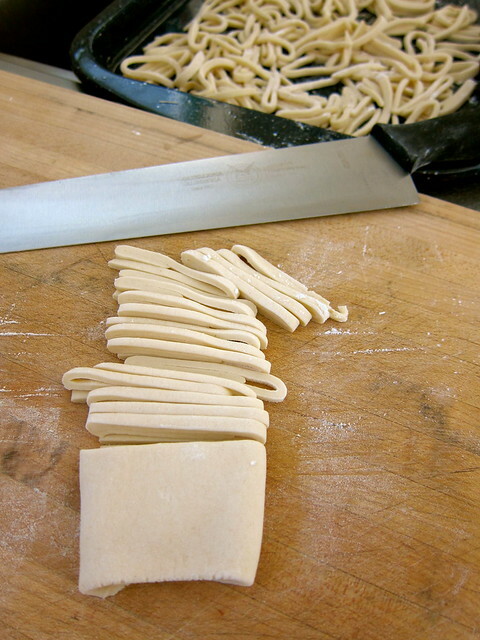 With one pass of the dough through it’s rollers, we immediately knew we would never fear making udon again. 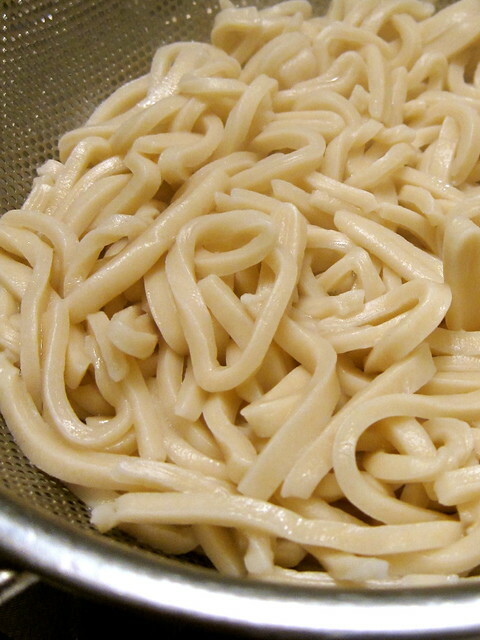 An extra tip: Unlike Italian pasta, Asian noodles are often rinsed with cool water after cooking. This helps to set the toothy texture, and rids them of excess starch to make them slippery, and the better for slurping with. They can then be served either cold, or rewarmed by placing them in a bowl of water. The success of these noodles was so unexpected, we just ended up dressing them with something improvised from the fridge. The thick noodles readily soaked up the leftover Mapo Tofu that we’d gussied up with some sautéed leeks from this weeks harvest, and thickened with a dollop of peanut butter. To offset the spicy richness of the sauce, we chopped up a hefty bunch of mixed Asian greens for garnish, tossed the pieces with sesame oil, then lightly sautéed them with some tiny dried shrimp to offset the mineraliness of the greens. Local ingredients: Asian greens from Two Farmers Farm; ground pork from Meadow’s Mirth; tofu from Heiwa Tofu; ginger from Wake Robin Farm; leeks and garlic from the garden. 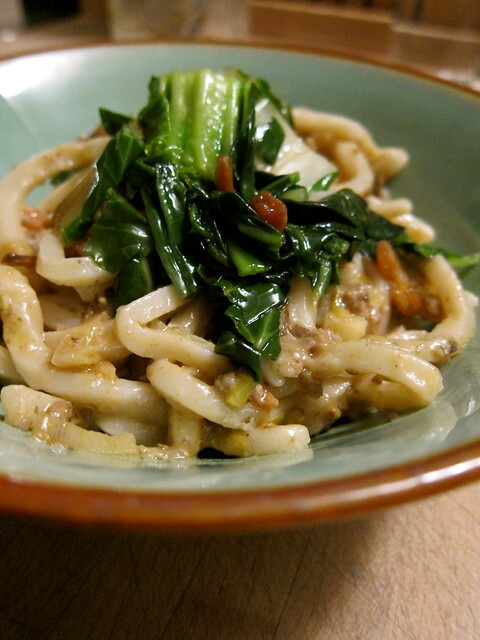 This entry was posted in cooking and tagged noodles, pasta. Bookmark the permalink. Could be a new Thanksgiving activity! Have just acquired a soba making board and knife, you read my mind! YUM! I love how unimtimidating you’ve made this. 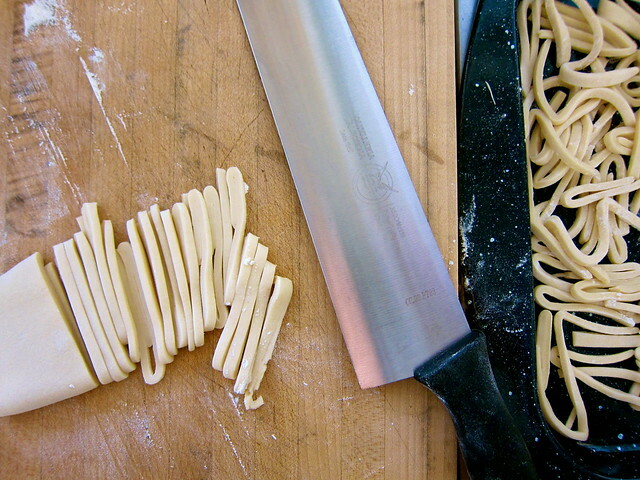 Soba noodles need a special board and knife?! Look forward to that! Not really necessary, but a good excuse to acquire new kitchen tools! We’d like to get to the point where we can roll the udon out by hand, but, until then, we’re not above using our pasta machine to ease things along! Stepping on your pasta is too funny! Looks delicious. It seems an activity kids would especially enjoy! That looks out of this world! My husband is Japanese but I have never made udon at home. I must try it. Thanks for visiting! It seems if you know how to make pasta, noodles shouldn’t be that big a leap!